In a way, the person we have to thank for this record is probably Eric Gallo. In 1926, Gallo was a 21-year old budding entrepreneur in Johannesberg, S.A., and owner of a small gramophone shop. Around 1930, after noticing that companies such as Columbia and HMV had begun to send engineers to South Africa to record local music, he decided to record local musicians on his own and attempt to start a business, with records being pressed in England and sold out of his own shop. Success followed. By 1932, he had set up the very first sub-Saharan recording studio. In 1949, he built a record pressing plant. At first, his label was named Singer, then later Singer-Gallotone, then, by the early 1940s, simply Gallotone. It was a major challenge to all the foreign labels attempting to do business in the country – certainly the most important South African label in history. Gallo branched far from South Africa to reach other markets, contracting ethnomusicologist Hugh Tracey to travel as far as Uganda to record local musics. This was foresight on Gallo’s part, as the bulk of the income generated by Gallotone came from sales of Afrikaans records. 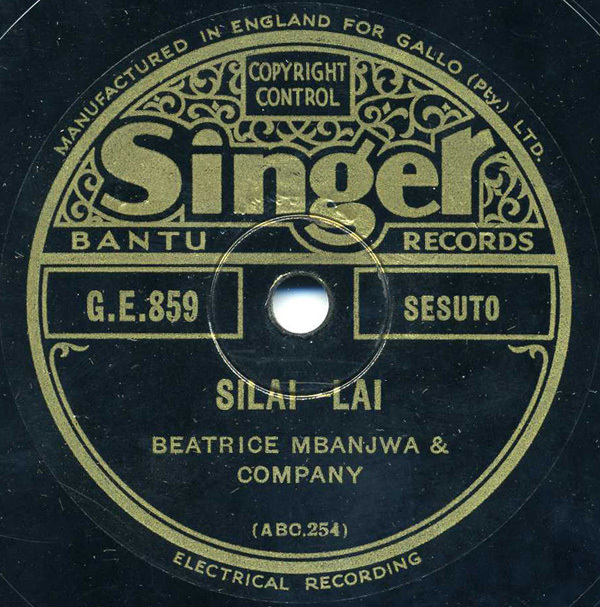 This piece by Beatrice Mbanjwa and her group, accompanied by piano and strummed banjo, was probably recorded around 1939 or 1940 when Gallo’s label was still named Singer. I could find little information on Ms Mbanjwa, except that she did take part in Johannesberg’s massive 1936-1937 “Empire Exhibition” as a performer, along with the Darktown Strutters, and many other musicians.